Chris Felix's painting of Joey Votto greets visitors to the Fitton Center gallery. Joey Votto stares at me as I walk in the door. That's the first picture I noticed at the Reds Hall of Fame's "Road Trip" art exhibit at the Fitton Center in downtown Hamilton. It's an amazing lineup: Bench, Rose, Morgan, Peter, Larkin, Nuxhall, Andy Warhol, Leroy Neiman, Jim Borgman, C.F. Payne, "Peanut Jim" Shelton and Schottzie. In prints, sculptures, cartoons, sketches and photographs. The Reds dug deep into their archives to provide 89 pieces of art – many of which I've never seen. And certainly they've never all been displayed in one place before, as they will in Hamilton through April 5. Pete Rose at bat in Crosley Field in 1967. 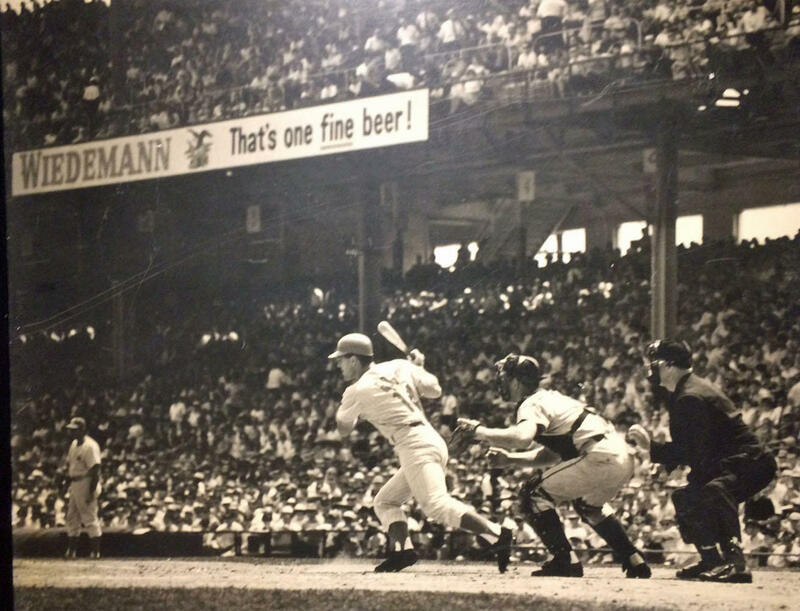 One of my favorites was a huge 1967 black-and-white photo of Pete Rose at bat in Crosley Field, like the big pictures that were above concession stands at Crosley Field, which the Reds abandoned for Riverfront Stadium in 1970. 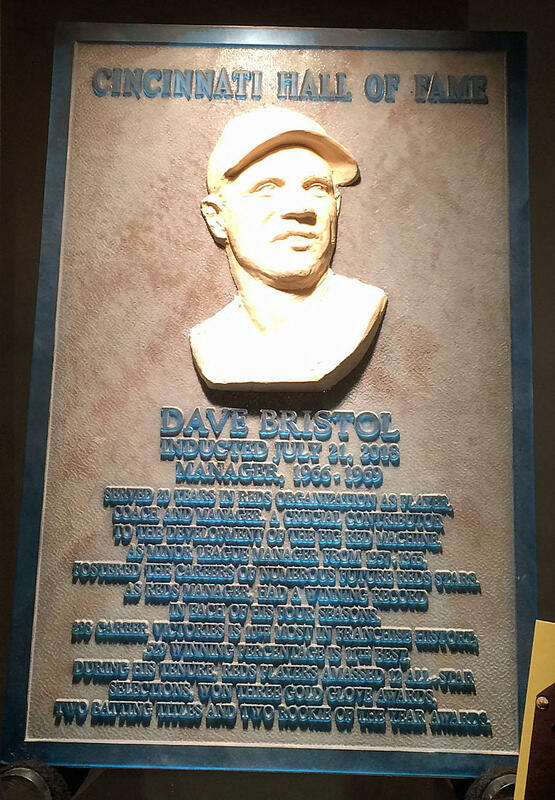 Sculptor Tom Tsuchiya's model for Dave Bristol's Reds Hall of Fame induction plaque. Nearby are four miniature versions of Tom Tsuchiya's sculptures of Big Red Machine teammates Johnny Bench, Tony Perez, Joe Morgan and Rose, which grace the entrance to Great American Ball Park. Miniature version of Tony Perez's Great American Ball Park statue, in front of Chris Felix's Leo Cardenas painting. 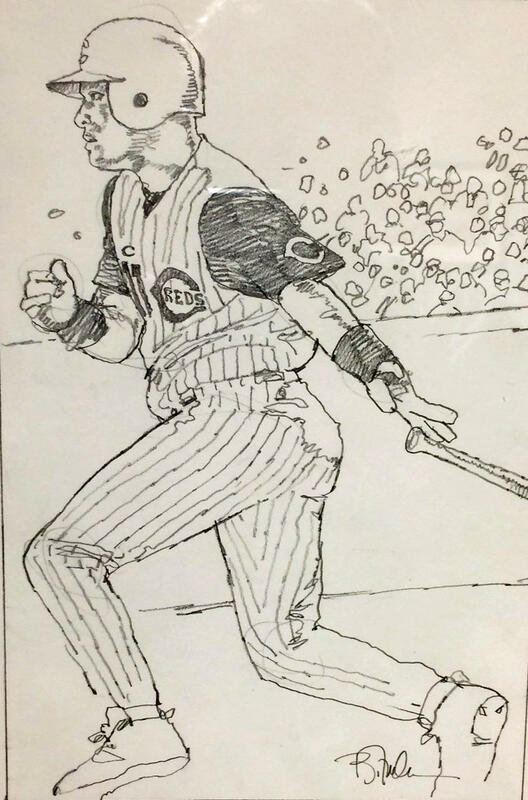 Bart Forbes' Barry Larkin sketch for the Larkin poster given to fans in 2012 when his No. 11 was retired. Another cool piece is the line drawing of Barry Larkin commissioned by the club from Bart Forbes when the Hall of Famer's No. 11 was retired in 2012. The sketch is framed next to the color print given to fans that day at Great American Ball Park. 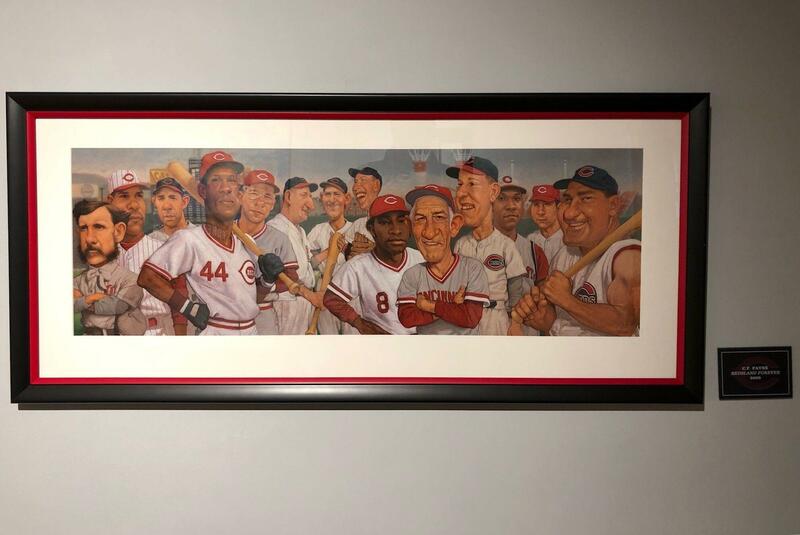 Artist Chris Felix is well presented with prints of players through the years: Votto; Nasty Boys Randy Myers, Rob Dibble and Norm Charlton from the 1990 World Champions; Johnny Bench; 1960s slugger Vada Pinson; shortstop Leo Cardenas; and of course, Hamilton native Joe Nuxhall. So are artists John Leon, Bill Purdom and John Wilson. 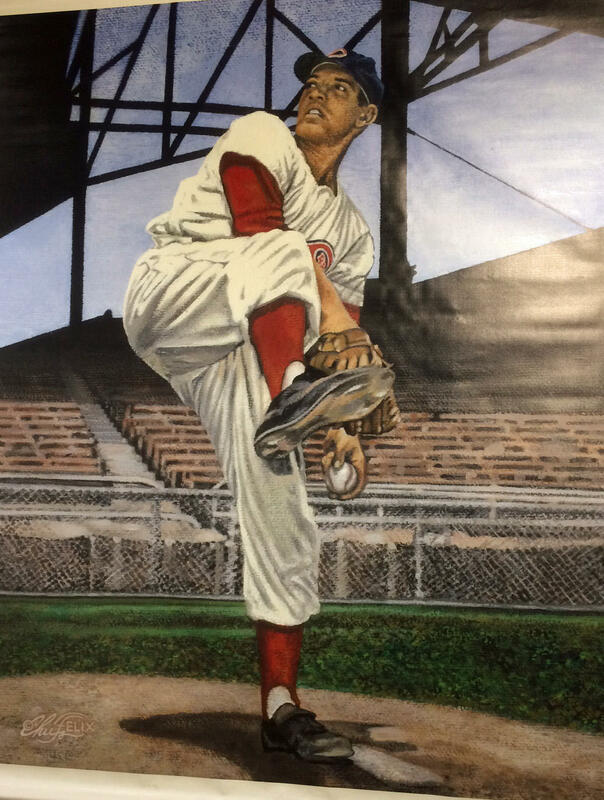 Joe Nuxhall by Chris Felix. West End vendor "Peanut Jim" Shelton. 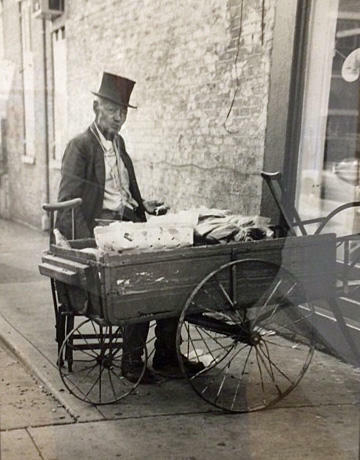 Longtime fans will smile seeing "Peanut Jim" Shelton, dressed in top hat and tails, with his wooden roasted peanut cart on a West End sidewalk. My dad was one of his regular customers when he took us to games at Crosley Field in the 1960s. We always had to buy a paper bag filled with peanuts on our walk to the game. 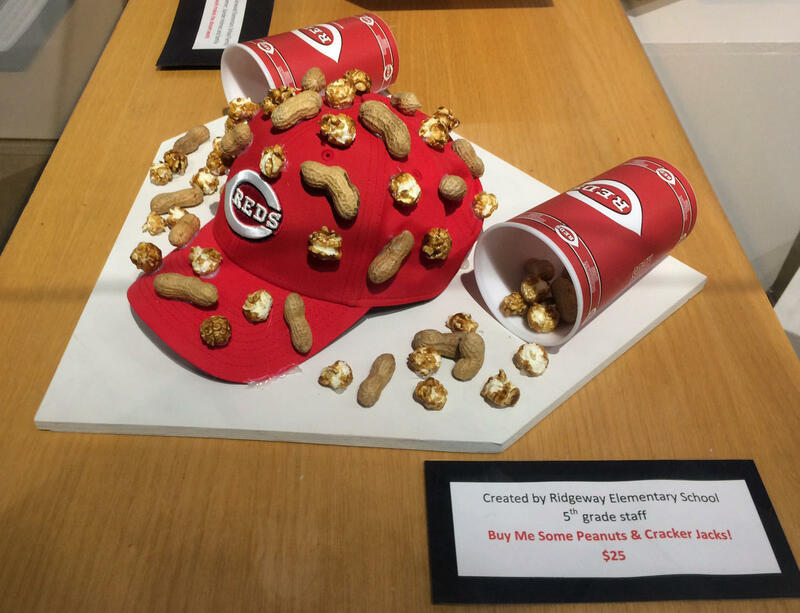 "The Reds Hall of Fame has incredible memorabilia. This is a chance for the Reds to show off its world-class collection," says Ian Mackenzie-Thurley, executive director of the Fitton Center for Creative Arts. Rose dominates one of the gallery rooms. On one wall is Warhol's Rose painting commissioned by the Cincinnati Art Museum in 1985, as the Reds Hall of Famer was chasing Ty Cobb's all-time hit record. It is one of 50 limited screen prints signed by the artist. A few feet away are a trio of Rose sketches by Leroy Neiman - "Pete Rose at Three Rivers," when the Reds played the Pirates in the 1970 National League Championship Series at Pittsburgh's Three Rivers Stadium; "World Series," with Rose and Bench in the 1970 championship series against the Baltimore Orioles; and "Pete Rose – Unshaven" from his 1985 pursuit of Cobb. 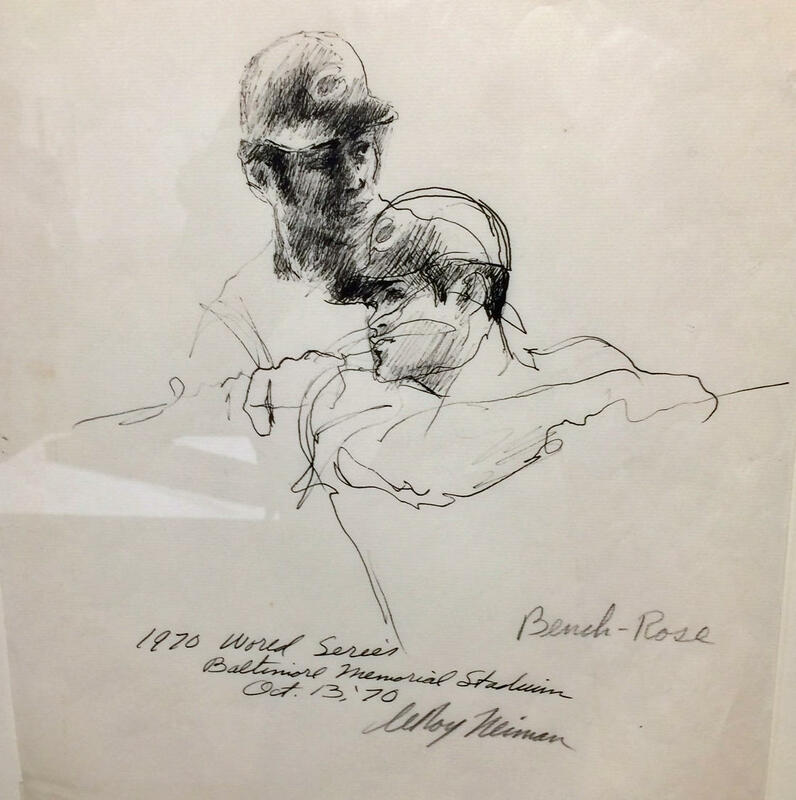 Leroy Neiman's drawing of Johnny Bench and Pete Rose at the 1970 World Series. 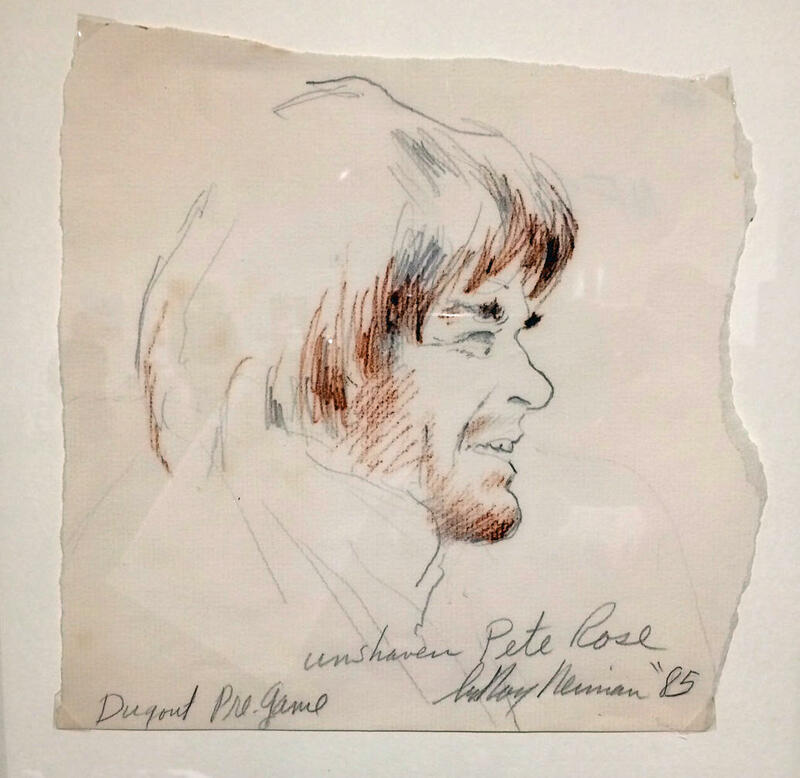 "Pete Rose Unshaven" drawing by Leroy Neiman in 1985. Former Reds pitcher Brett Tomko also made the roster – as an artist – with his portrait of Pete. Who knew he started painting on canvas after painting the corners with his fastball? Tomko pitched his first three seasons with the Reds (1997-99) in an 11-year career that took him to Seattle, San Diego, St.Louis, San Francisco, Los Angeles, Kansas City, New York, Oakland and Texas. 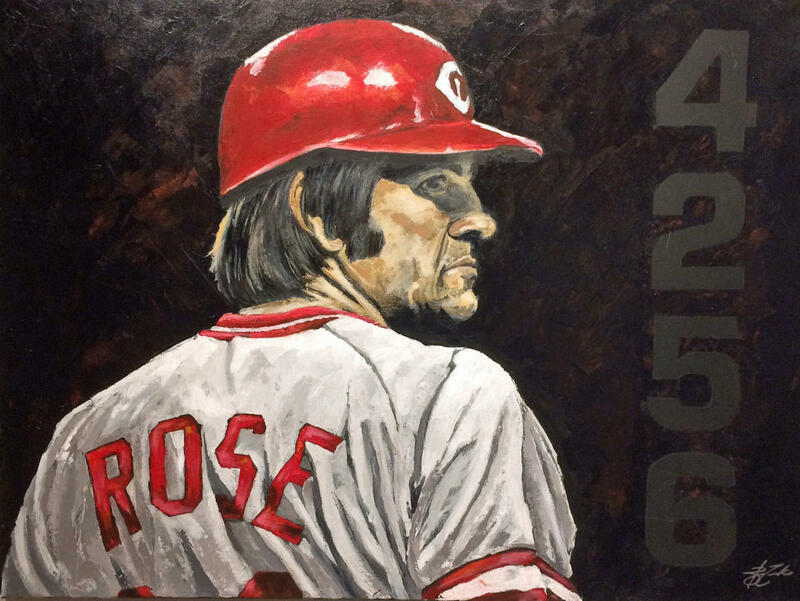 He painted "Rose 4256" (Pete's final hit total) in 2016, when Rose was inducted to the Reds Hall of Fame. Former Reds pitcher Brett Tomko painted "4256" when the Reds retired Rose's No. 14 in 2016. 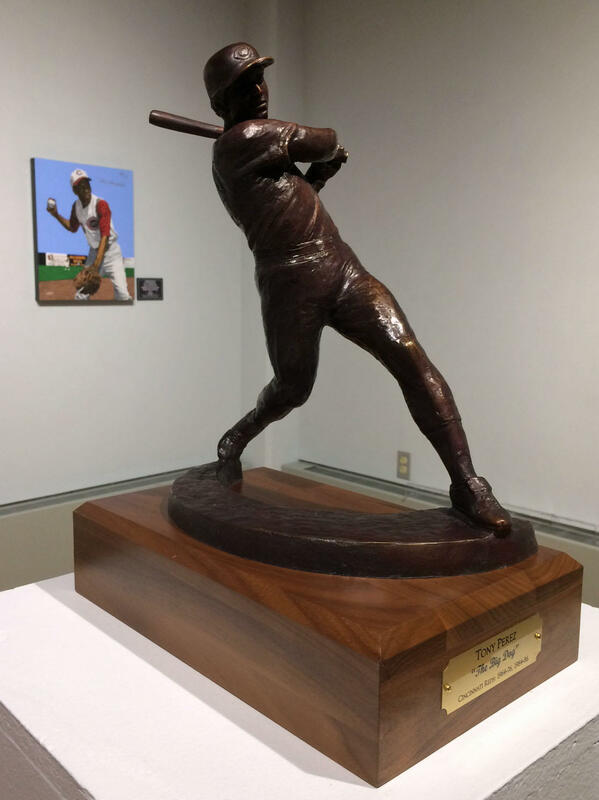 "Much of the artwork has either been at the Hall or was commissioned by the Hall of Fame for an event, celebration, such as the statue replicas, and some of Chris Felix's works," says Rick Walls, Reds Hall of Fame executive director. "I believe there are a few items that are making their first appearance." 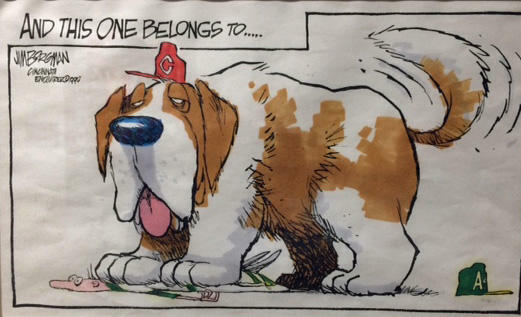 There are two Schottzie cartoons from the Enquirer after the 1990 World Series sweep. One is signed by Pulitzer Prize-winning cartoonist Jim Borgman to Reds President Marge Schott: "To Marge – Thanks for bringing home a win winner!" The exhibit also includes illustrations by Jerry Dowling, Jeff Shahler and Joe Hoffecker. Jim Borgman's take on the 1990 Reds sweeping the Oakland A's. "Road Trip" has been in the works for about two years, MacKenzie-Thurley says. The timing worked perfectly – with the Reds Hall of Fame closed through March for a major renovation, and the Fitton Center celebrating its 25th anniversary. 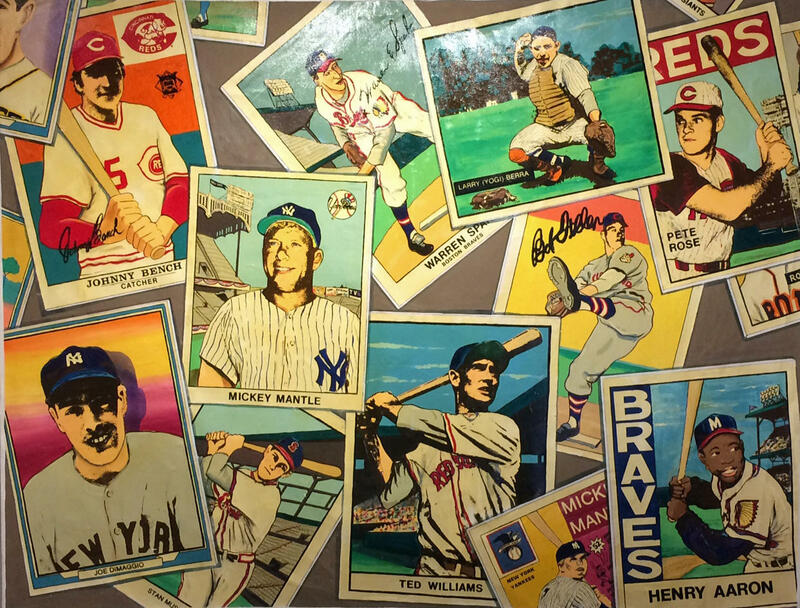 A large baseball card collage on display at the Fitton Center. "We feel incredibly privileged to have this in exhibition. It's phenomenal, and everyone needs to see it," he says. "Not because it's in Hamilton. Not because it's at the Fitton Center. But because it's nowhere else." Hamilton's Ridgeway Elementary School first-graders created this for the Fitton Center exhibition. "Road Trip" is free and open to the public at the Fitton Center, 101 S. Monument Ave., one block south of High Street in downtown Hamilton. The second-floor gallery is open noon- 7 p.m. Monday-Thursday; noon-5 p.m. Friday; 10 a.m.-2 p.m. Saturday. On the first floor is baseball art from Hamilton's Ridgeway Elementary School students and Hamilton's InsideOut Studio, a partnership by the Butler County Board of Developmental Disabilities and Easterseals Serving Greater Cincinnati. Ridgeway Elementary School fifth-grade students created this for the "Road Trip" collection. Thrall is expected to do the postgame show starting with the Reds-Indians spring opener Saturday, Feb. 23. Marty Brennaman and Jeff Brantley will call the game. The Fitton Center for Creative Arts in Hamilton continues its 25th Anniversary celebration with a wide array of programs and exhibits.